Congressman Charlie Rangel said today he would support a Rudy Giuliani - Bernie Kerik ticket. He was joking. 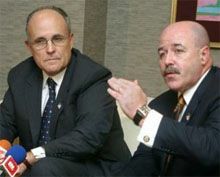 Political observers say Giuliani's relationship with Kerik could be a problem if the former mayor goes ahead with a run for president. Gee, you think? Here's some TalkLeft background on Rudy and Bernie. More here and here. There must be a role for Judith Regan in here someplace. What cabinet post would Rudy and Bernie award her?